Couple of weeks back there was big hue and cry over report (pdf) from researchers at Princeton University that came up to a conclusion that Facebook would lose 80% of their users by 2017. The report essentially said that they will get into similar situation like MySpace and majority of users will desert them in next 3 years. Facebook rebuked the research in the best way possible. They came up with a (fun) theory that demonstrated that Princeton may be in danger of disappearing entirely! In my personal opinion, Facebook is going to be around for a foreseeable future as long as they keep listening to users and give them what they want. Leaving aside these theoretical and hypothetical research outcomes, we decided to look at some hard numbers to understand how Facebook has been doing in terms of growth. To compare, we looked at some of the stats we had come up with in August last year based on the numbers that Facebook gives out on their ad platform. Currently, if you choose “All users in India”, Facebook shows 96 million users. This number in August last year stood at 95 million users. 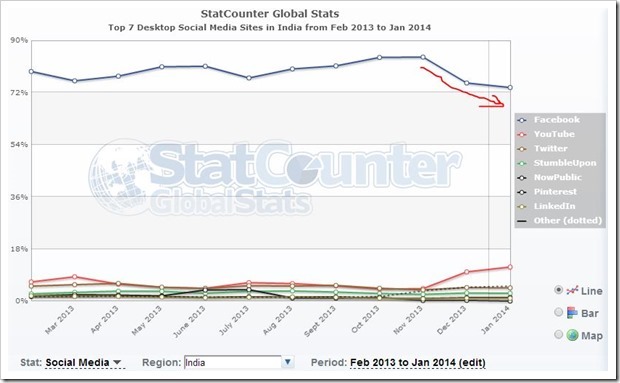 What this essentially means is that Facebook user base in India has remained constant over last 6 months. One can safely say that their user base in India has stagnated. This is on the back of the fact that India is adding new Internet users at a healthy rate. Even if we see the above 30 and below 30 year age user demographics, there is hardly any difference. We then decided to look at the traffic that Facebook was getting from India. The statcounter report suggests that Facebook traffic has dropped quite significantly in last 2 months. The stats indicate that among all Social media traffic originating from India among all platforms, Facebook’s share has dropped from 84.28 percent in November 2013 to 73.73 percent in month of Jan 2014. This is also their lowest number in past 12 months. See the graphic below to understand. On the other hand, due to Facebook’s fall, Youtube’s share has risen quite drastically, from 4.28 percent in November 2013 to nearly 11.74 percent in Jan 2014. One has to bear in mind that 2 months is a very short period to draw any conclusions in terms of traffic. What should be more worrying factor for Facebook is that they are not seeing user numbers growing in India. In our view, Whatsapp and other mobile messaging platforms also have a major part to play. These IMs provide needed privacy and users do not have to worry about anything else, unlike on Facebook where they need understand the platform well to use it properly. Bottom-line is, Facebook is finding it difficult to grow from the point where they are at currently in India.